Lupita and Grisel for the first full moon of the year. Merida , Yucatan , Mexico . any, as this Dutchman obviously must have quickly learned. allow shopping on Sunday…yes comical indeed! the airport that have shuttle service. man in town and the largest landowner in the area. at Haarlo, a town about six miles distant. especially in Holland where rain and clouds are the standard. Camped by the pond in Haarlo. Our VW is in the center of the photograph. private pond, shared only with the croaking frogs. shop. In the parking lot was a display of high speed Internet and everyone was encouraged to give it a try so we did. sprockets; we huffed and puffed our way along the bike path. before that held six tea light candles that was to be installed in our engine to heat it enough for a start with its S.A.E. Fahrenheit and a cold rain driven by a nasty wind that came roaring in noisy bursts that could be heard from far off. performance a few minutes later. partake of our Brie, rye crisp and red wine lunch the gray skies turned black and down came an icy torrent of rain. “space suits”, were providing us an unbelievable sanctuary from the harsh frigid elements. our departure for our trip up the Rhine River to Boden See high up in the Alp Mountains . the 2nd of May will be our departure date. Emslandroute, or the “KAST”, Kastelenroute. and that has turned out to be one of our better purchases and made cross-country biking a real pleasure. be enjoyed in out of the icy rain that was blasting us the entire trip. needed and I wound up with plastic bags over my wool knee socks and I am still searching for my size foot guards. hazelnuts and packed for our trip. refreshing. We do find that they are silent on those subjects when there is an audience of locals. year. Well, now we had it and it was time to settle in for homemade soup and feel the warmth of our electric heater. temperature downstairs near freezing, we are toasty warm without the heater on. can sympathize with some of their sentiments. questionable terrain and up unexpected grades. canopies and put away the outdoor dining furniture. We loaded the bikes and departed by 9AM as the rain let up. brewery. The end product is near perfection so the building doesn’t make the beer especially in the case of Grolsch. occupation in the 1500s by the large fort and moat in the city center. to a comfortable temperature and we needed to unzip a few vent flaps. business. We were just about to give up and travel on when I spotted a young man seated at the reception desk. were happy to get in, shower and stretch out. 56 Euros with breakfast and a lunch, to carry with us was a fare price. that made Germany cheaper than Mexico . breakfast buffet and hi-octane coffee lifted our spirits to face the down pouring rain we would soon be biking in. direct access to the Rhine River and the Atlantic Ocean . these places. The friendly service and quality are complemented by the selection of our favorite foods. 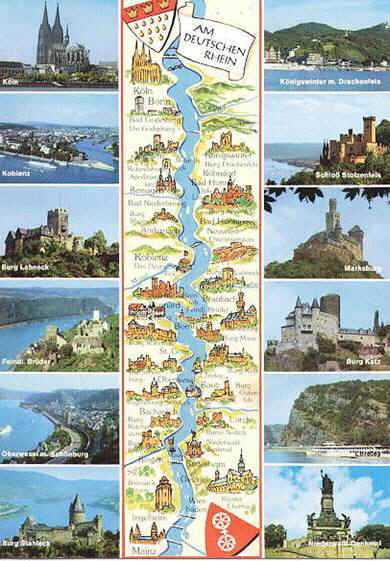 almost every inch of the Rhine River in Holland and the middle Rhine in Germany , which is the “castle district”. This is a good place to explain the name “ Rhine ”, which is an English spelling. 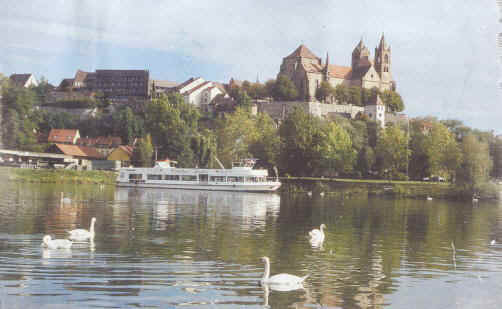 there is a city of Rheine , pronounced, “rye-ner” and through this city flows the Ems River . we crossed packed with cargo vessels on the move, the only ones not moving were busy loading and unloading. further east of our intended course and tried to compensate. cold dark and damp day was taking its toll on our endurance and desire to move on from this point. even started to distrust my compass, a sign of fatigue and becoming fuddled. spotted a hotel. 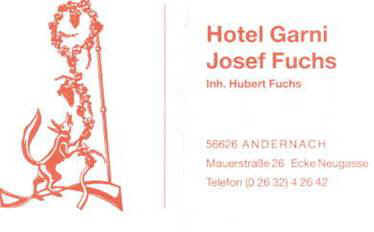 Jane and I both had agreed that the first hotel we encountered we would take. 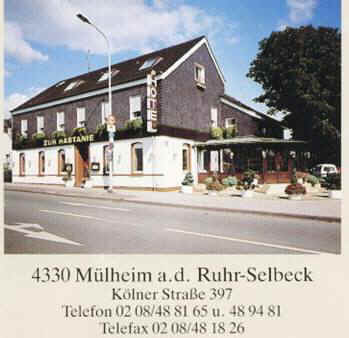 At the small town of Mülheim a.d.Ruhr-Selbeck was located the hotel, “Zur Kastanie”. together with a network of locks and canals. The railroads do the lighter lifting. and dry, but we would require more rest and vitamin “C”. encouraged to pack a carryout lunch from the buffet, which helped take the sting out of the steep room price. the years that we always pack far too much sunscreen when traveling in Europe . persistent tailwind that pushed us up several steep hills. were somehow stranded. Our corkscrew has no rust. imperative unless you go east. or old downtown city center we got into more bicycle friendly country with designated bike paths. less and less these days but are mostly a hundred times more physically fit for endurance than the Americans. several years earlier we spent two weeks aboard a freighter with an all Bosnian/Croatian crew from the town of Split . They were excellent cooks and very friendly people. trying not to get killed in the trolley rail groves that run off at all sorts of angles to our course. knife from my Leatherman tool. I have found that tool completely indispensable in our excursions. we needed to head to rendezvous with the Rhine. 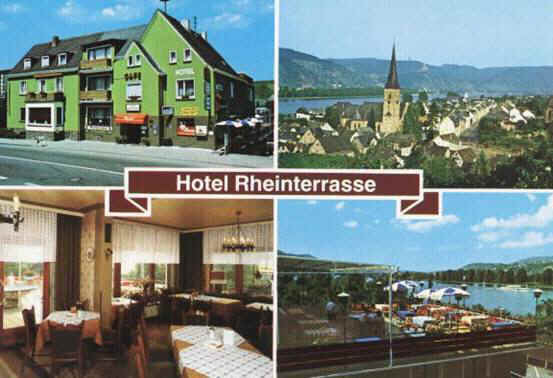 We were presently surprised to find that we were only a couple of hundred meters from the promenade of the Rhine. the same year I was. You could tell he really loved America and wanted to tell us so. Kaiser rolls made the atmosphere of the Rhine River. looked forward to the upcoming days. the water was high and running fast due to all of the rain. considered biking in the river only along side of it. break sitting in the sun. high above the level of the Rhine. The weather was warm as we had our lunch but it soon cooled off again that afternoon. my bike. Jane almost creamed me but locked up her brakes to stop. There was no bike damage so it was up and on. This was my only spill of the trip and nothing got broken though I had a sore wrist for several days. them please not to judge Mexico by that crummy border town. up the hill from the river. This year the water had reached the front steps. nice breakfast with the owners and exchanged lots of travel stories with them. again found that we were in for another detour because of the high water. weather was finally cooperating with us, it was a beautiful sun shiny day. craftsy" German style closet stuffing stuff. any tourists and glorious weather. This PM we took a leisurely lunch break to soak up the sun, the first in a week. true. However we did manage to witness some extra stout Germans, “the super race”. must have been what we were supposed to look at for the price. Two years earlier we had biked this portion of the river. It is definitely the most spectacular section of the Rhine. and some get tugboat assistance. Germans have a compunction for tuning everything to perfection. of which aggravated her condition. back. This lovely place is lined with castle after castle all ancient, distinctive and majestic. to see if anyplace else was available…nothing. calamity doens't befall this town I am sure that these houses will stand another thousand or more years. 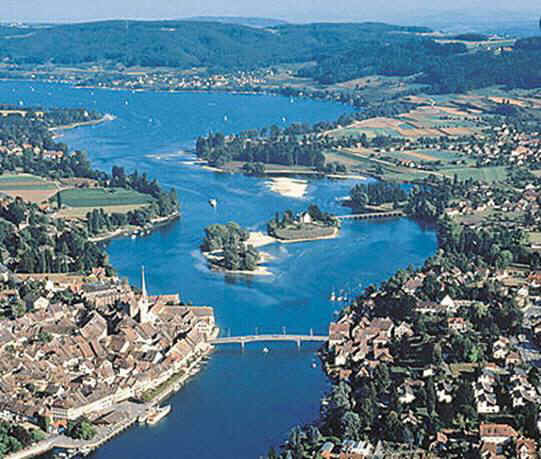 stretch of the river to our next town of Bingen. equally early snooze…we both needed it! drizzle coming down. The breakfast was adequate and ample and resembled a boarding house atmosphere. hotel was directly on the bike trail so it was fine. aspen trees three feet thick on the stump. across from the confluence of the river “Main” on the south side of Mainz. 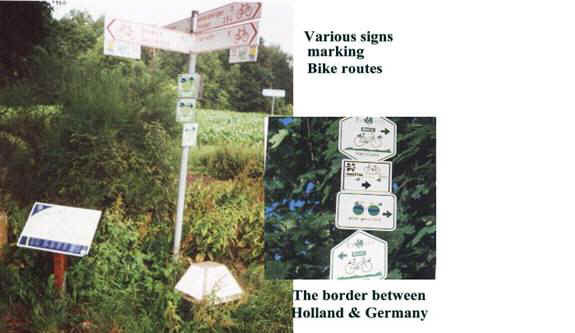 alternate route that was known as the “Wein Strauße” or wine road. We were ready for a siesta so we cleaned up and laid back to listen to Armed Forces Radio and had our PM coffee. of living second to none with free social medicine and an average yearly retirement check of $100,000 per person. buying any aircraft carriers either. hadn’t gotten a room for two nights in spite of the fact that we were definitely off-season. Saturday, May 11 after a very sound snooze we were up to a lovely breakfast with fresh baked home made bread. cities and seek out the least traveled roads. be a gear grinding and brake burning experience. eight different places and they were all full. icy rain came pouring down. The rain was great as long as we were not out in it getting soaked. we didn’t have an extra inch in us and were very happy for the serenity and the breakfast that was world class. The day had proved to be one to test our endurance and there would be many more like it with even steeper grades. they could easily afford the accommodations. were on a continuous down grade, our kind of biking! traveling so very interesting to us. the mess. We know a Muller family in Florida with a garage that would fit right in the scene. compass directions and didn't know how to read a map. that was far off our intended route that was priced in the stratosphere. 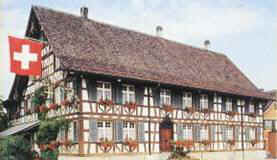 “half timbered” as some people call them. heavy forests of extreme beauty. forgotten my lock and chain but it was just too far back to even consider a return to retrieve it so on we went. so we turned at the first street that looked like the right one. We came to a detour and discovered that we had been dumped directly onto a very busy Trans-Europe highway. to use some English and we had a good time and left him smiling as we departed with an “au revoir”. on a sunshiny day with the river roaring past on its way to the sea. along in a mostly straight line using a series of dikes, levies, and locks that let the river flow along at it’s own pace. At the same time providing a mostly calm waterway for the boat traffic. hours of riding behind us this day already. traffic as they paid little attention to us. with all of the beer. smothered with butter (definitely not health food) for our breakfast. more laid back and definitely go at a lot slower pace except on the highway. Forest as we roamed the fields in search of black berries five years before. something that few people ever attempt and especially Americans that are not seen even walking around in Europe. weaknesses. We demolished the entire jar that night with dinner…self-indulgence gave way to gluttony! several detours that were not on our new maps. on the other. The wildlife and forests along the way made it one of the nicest stretches of the river we had seen. close and both Jane and I had to stop several times just to observe them. Breisach, Germany and the Rhine River viewed from the French side of the river. German side was definitely the very best and we didn’t see anything on the French side that made us want to go on. the morning back in Breisach, a lovely town even if they catered almost exclusively to tourists. would be no going on without it, the old one was totally gone. check our e-mails. We were home for coffee and to watch CNN and wash our clothes. respiratory problems were much better, but we were day by day wearing down. 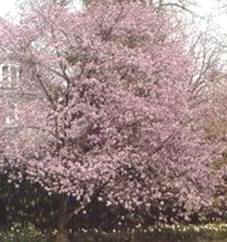 Friday the 17th of May, we arose to a spectacular spring day and went down to an early big breakfast. around the area the day before unburdened by our packs, now we were fully loaded. such a lovely place with the best of bluebird weather and have the entire place to our selves…memorable indeed. encounter many swans up close. and makes it possible to use this portion of the river year round in spite of river conditions. widened out and cascaded over rocks. reserve so it is a big draw to outdoorsmen. 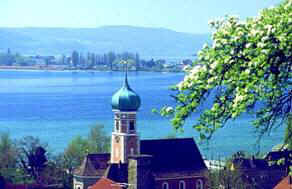 town of Weil. We later found that to be very good advise. destination, which was a little hillside town. It was hot and we were ready to quit. had low gears that were twice as low as our gear ratios. problems and some gigantic apartment complexes filled with immigrants from Eastern Europe and the Middle East. to make sure that our staple provisions were adequate because all stores would be closed the next day, Sunday. many times that morning we crossed over and back. when we were in the city of Detroit in the USA all of the employees in the hotel we stayed at were from Albania. contend with heavy traffic, we rolled along. Germany. We didn't even know that a large part of that morning we had been bicycling in Switzerland. to pursue along the river. catwalks for nearly a half a kilometer. We had the option of retracing our path but thought it best to press on ahead. that pulled this trick on us we finally learned. radio or TV but we had lots of reading and writing to do plus the price was 40 Euros with breakfast. breakfast was OK but lacked the touch we had come to expect in German hotels. 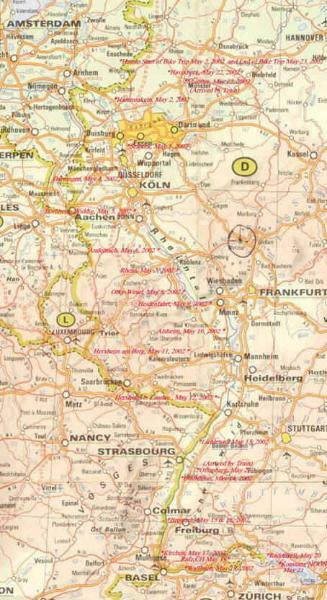 In this area it was impossible to tell what country you were in as the border changes direction continuously. The beautiful towns of Laufenburg, Germany and Switzerland. 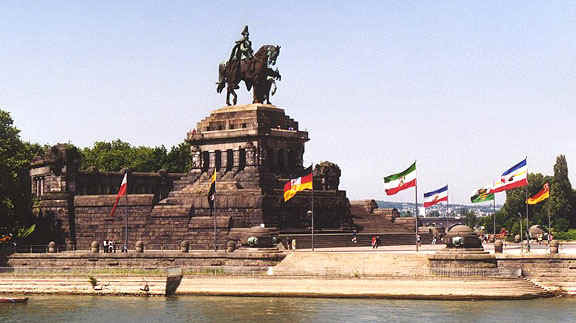 The Rhine River is the border between the two. we made several diversions to converge with it through this scenic country that didn’t have a single flat river valley. huffing and puffing up 12 % plus grades when we weren’t burning our brakes off on some sizzling down hill slope. 1642 and was in continuous service ever since. Monday the 20th of May was cold and bright as we set off on our bikes to face the steep inclines that lay ahead. accidents we knew that there just had to be some dillies. approached from high up on the crest of one of the surrounding hills and could see our river far off and down below. were taken in by the beauty of this fascinating city on the river that was not easy to reach by bicycle. to do this trip because we were now getting a completely different perspective than we had ever had. we couldn’t blame all of the others for being here. swept down off the snow capped Alp Mountains. make in the coming years. surly at best. They didn’t wanted to even be bothered with questions let alone respond to them. the gasoline price being over five dollars per gallon. might have accommodations as we didn’t have any more kilometers of travel in us at that time. beer and she must drink it herself. had been totally sold out. Tuesday the 21st of May. This was going to be a very long day filled with plenty of surprises. had anything to do with the building of the business. the point where we were stopped and confused earlier. enjoyed it immensely we didn’t feel like it would be the place we would want to return to. 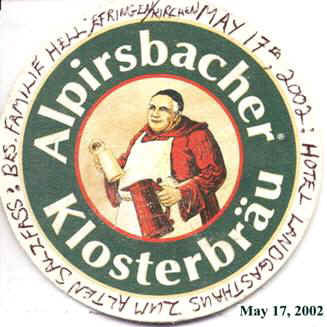 alpine forests and flower filled meadows. have loved to tag along with us. swimming in the crystal clear waters gave us a feeling that we had completed another bike trip of a life time. we had on our entire trip. a half price or two for one ticket, which made it even better. assigned, but you do pay dearly for these luxuries. our good fortune to have had this fabulous adventure as part of our Rhine River trip. ahead of the season and had boundless selections but we were just too tired to shop. our room to watch CNN and quaff down a nice bottle of French wine with our pizza. headed east by bicycle to the Bodensee and by that evening we had gone north by train. superb and the manager did everything he could to anticipate our every wish. We were very pleased. that some one would be on hand to assist with loading our bikes. philosophical discussions. We passed the time quite pleasurably. West Bank as we headed south. the very prettiest stretch of the Rhine River Valley known as the Middle Rhine. 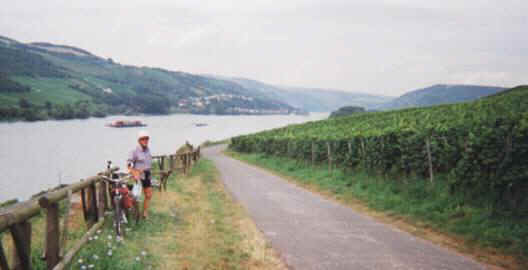 cultivatable piece of land for the production of wine grapes for their famous Rhine wine. 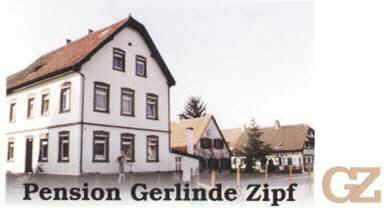 one of the most visited parts of Germany as it ties in with the “Black Forest” area. were added to our spirited and many times humorous conversation. It was a fine and very memorable day well spent. one thermos of hot coffee so we decided to set off in the direction of home in Holland. 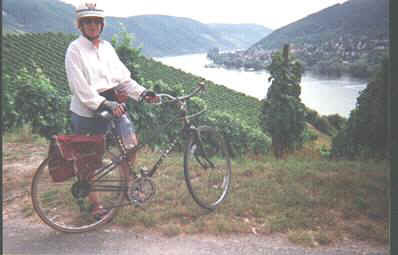 As we bicycled through Munster we were surprised at the number of fellow bicyclers and the excellent bicycle routes. at the bike trip we had just completed. on our way out of town through the many hills that surrounded this area. for our favorite French red wine and dinner delights we were ready to shower and quit for the day…we were “kaput”. answer. As for quantity we were approaching the glutton stage. Our hunger was powerful but we didn’t snack. confused, so she stopped to share information with us. Her map was better than ours, but proved no more useful. is where she was headed, being lost herself. lived in Mexico City. We exchanged e-mail addresses and have corresponded since. roads but neglect the names of the side roads. countryside by a little lake. It felt like a picnic because of the solitude and tranquility away from all sounds of traffic. and as an old friend used to say, “our noses were in the stable”. trip and our train trip crossing four countries in 21 days and nine hours…not to be forgotten! 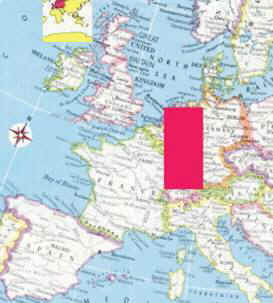 Map of Europe, the red area represents the map below of our bicycle trip. 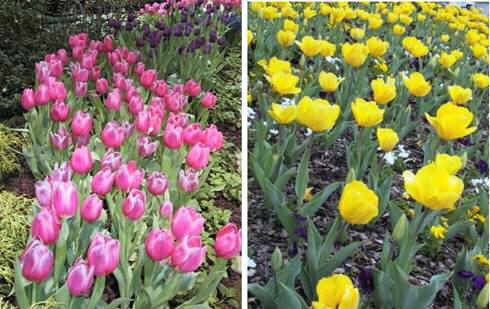 filled with tulips in full bloom. in many years of bicycling. competition for the fresh baked Kaiser rolls.